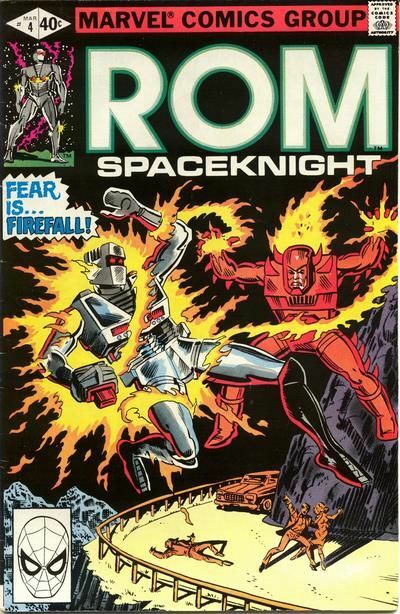 The issue opens with Rom going up against his former friend’s armour, now worn by a human being, in a battle both fierce and deadly. The human being, named Archie Stryker, believes that Rom has been killing innocent humans not knowing that they are the alien dire wraiths, evil personified. So when he is given the chance to wear a suit of armour much like Rom’s, from those very villains, he takes it. The wraiths are wily though, and as they have Archie battling Rom, they have also kidnapped Brandy Clark, Rom’s only friend on the planet and it seems as if both she and Rom will be battling for their lives. Bill Mantlo has a way with words that make you get invested in a book more so than you might have otherwise thought. As Rom battles the Firefall cyborg with Archie Stryker on the inside, he reminisces about the past and his friend Karas, his best friend, whom he lost during the Wraith War. The tale is a sad one and Mantlo knows exactly which buttons to push to make you feel as such. Brandy is becoming a fairly strong woman from the person she used to be, due to her newfound circumstances and knowledge, and it is nice to see her character progress even though it has been four short issues. A great book filled with fantastic drama by Mantlo and all of it, including the fiery battle scenes drawn expertly by Sal Buscema who is on the top of his game.